Tinytag data loggers were deployed in temperature profiling of submerged cave passages. The Portuguese Speleological Society used waterproof Aquatic 2 data loggers to monitor water temperature in cave systems. In 2015, as part of research for the Alviela 2015 Cave Project, three Tinytag Aquatic 2 data loggers were deployed in submerged cave passages in a unique karst massif just north of Lisbon, Portugal. Ricardo Constantino is the Diving Team coordinator for the Portuguese Speleological Society and also Project Manager for a citizen science initiative, Project Baseline. As part of the research, Ricardo's Team undertook temperature profiling and the resulting profiles have provided valuable data in terms of water source and depth/range of the passages. Dives were programmed to deploy the loggers at different depths in different passages, from 10m to 90m depths, and retrieved for data download three years later. The data has proved very useful for geologists in providing information about underground water flows. After analysis, the geologists are able to identify further investigation points that typically require additional dives for more data collection. Ricardo chose Tinytags for their robustness and wide depth range (up to 500m). He found them easy to use with fixed time stamping of data, and with flexible logging parameters. 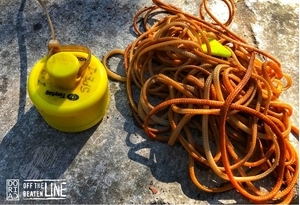 He comments, "It was a thrill to find the bright yellow loggers lying where we had left them almost three years before! Two winter seasons with the typical high water flow did not damage the units." The photograph shows one of the data loggers after retrieval. Monitor underwater environmental conditions with a Tinytag Aquatic 2 temperature data logger.